Vapeur | Beer Apprentice - Craft Beer News, Reviews, Interviews and Info. Hello everyone. 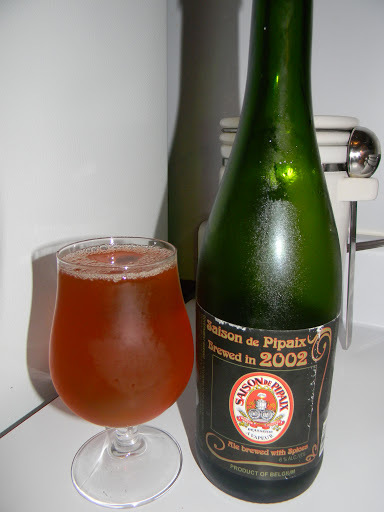 For today’s craft beer review I’m going to be giving a 2002 Saison de Pipaix by Brasserie a Vapeur located in Pipaix-Leuze, Belgium a taste test. I don’t know much about this brew and I’ve never tried anything from these guys before, so I’m really interested in seeing what they can do. Here’s the description that was posted on their website, vapeur.com. This brew came in a 25.4 oz. bottle with an ABV of 6.0%. It poured a clear, orange color. Literally no head was formed from a fairly aggressive pour. Only a few large, off white bubbles were shown, which left a very small, very thin ring around the top. Hmm. The nose was very musty and moldy smelling. A strong cardboard type of aroma. Almost rotten. Astringent to the point of where I didn’t even want to stick my nose in when taking a drink. Just a mild touch of funk, and whatever spices are in there were completely overpowered by the earthy must. Honestly, this thing did not smell very good at all to me. The taste, unfortunately, was just like the bouquet. Moldy, musty, “old”, cardboard”y”. It was like it was completely oxidized or something. Just a slight touch of vinegar and acidity. I didn’t pick up any spices in the flavor either. Oh man. I struggled with this. Not very pleasing. The mouthfeel was medium bodied. A touch sharp and quite dry. No carbonation whatsoever. Completely flat. It left plenty of flavor behind, however it was a rank aftertaste that I did not enjoy. Well. I really hate giving a beer a bad review. I want to give every beer a fair chance, but I just couldn’t drink this. Very rarely do I ever drain pour a brew, but this is one that after about half a dozen sips I just couldn’t take it anymore. Have you guys ever had the 2002 Saison de Pipaix? What did you think of it? I’d love to hear another opinion. I did check on a few beer review sites after I drank this to see what other people were saying about it and for the most part everyone had favorable things to say. Maybe my bottle was just way too old or something. I don’t know. I believe it’s safe to say that I will not be picking this up again anytime soon, however if you guys feel the need to try it… by all means… knock yourself out.